Contents 1 sign, 1 cast iron sign base, 1 post and 1 attachment hardware kit. Sturdy sign & post kit makes it easy to get your point across! Reserve parking for those who need it. Reserved Parking Sign Kits ensure no one else parks illegally. 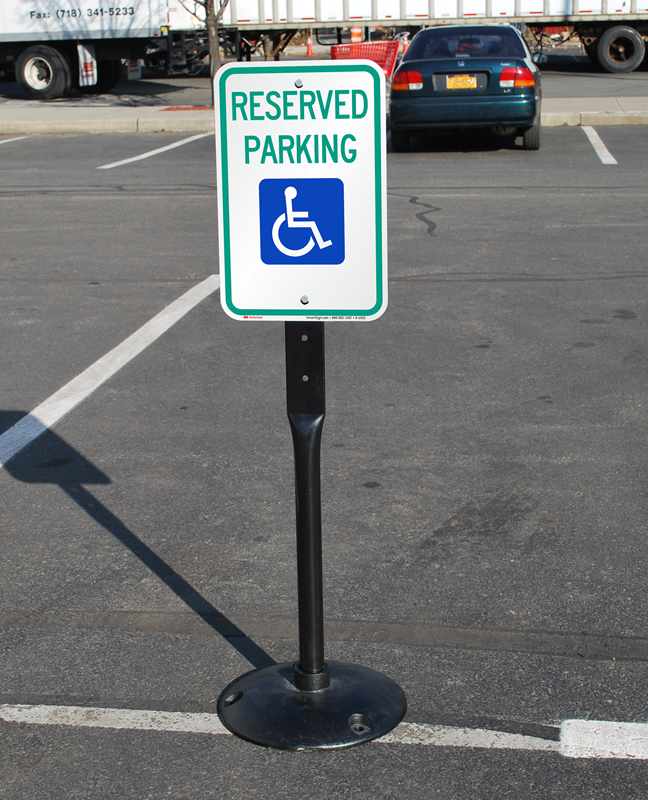 • Move this sign into place when reserving an area or holding a spot. • Built for stability, the base will not topple over during stormy weather or gusts of wind. • Sign is made from 63 mil thick aluminum with a reflective Engineer Grade overlaminate – improving nighttime visibility. • with the kit (i.e. the base, post, sign, and attachment hardware), saving you time and money from buying each component separately. • Cast iron weighted base deters theft, but can bolted to the ground via the base for additional security. • Please Note: In compliance with 2004 ADAAG § 216.1(3), these signs are intended for temporary use only. • 23.5 lbs. weighted base is difficult to tip over, even in stormy weather with high winds, making it great for busy parking areas. The weight of the cast steel base can vary slightly. • 14" diameter base includes a post that inserts into the center of the base, and comes with predrilled holes for mounting signs. • Solid cast iron unit is sturdy enough to resist abuse such as bumps, dings or dents from vehicular impacts. • Posts are ideal for temporary parking accommodations and are easy to move – requiring no drilling for installation. • Aluminum signs are 63 mil thick and resist weathering, corroding, and rusting. The material is pre-drilled with mounting holes for easy installation onto the provided post. • Engineer Grade 3M reflective film refracts any light directed towards it, such as flashlights or headlights. • Signs are screen printed with UV stable inks that resist fading and discoloration. They are guaranteed to last at least 7 years outdoors, although in practice most signs last much longer. • Kits are great for residences, schools, offices, restaurants, hotels, shopping centers, loading zones, malls, or just about anywhere a temporary traffic control device is needed.